The rim of the mater is riveted to the back plate, and has a scale of 60 parts, each subdivided into 3 parts. The inside of the mater has a latitude plate for 24 degrees. Shackle, with no extant suspension ring. The rete has 21 named stars, the supports for the pointers pierces by one, two or three circles or a trefoil design. The ecliptic, with the sometimes abbreviated names of the zodiacal signs divided to 2 degrees, is supported by an east-west bar and four ties. Four latitude plates, marked for latitudes 30 and 35? ; 40 and 45? ; 48 and 52? ; 55 and 60?, with lines for every 5 degrees of altitude and 10 degrees of azimuth, circles for tropics and equator and lines for unequal hours. 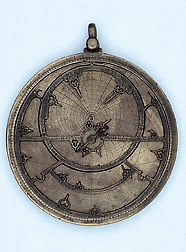 The back has a zodiacal calendar (with the first point of Aires at the13th March), with the constellation names, each sign divided to 2 degrees, and the months named (sometimes abbreviated), each divided to 2 days. A double shadow square has each side divided to 6 parts, subdivided to 12, not numbered. A central circular table is unfinished. There is a pin, counterchanged alidade (broken), each vane with two pinholes, and horse wedge.